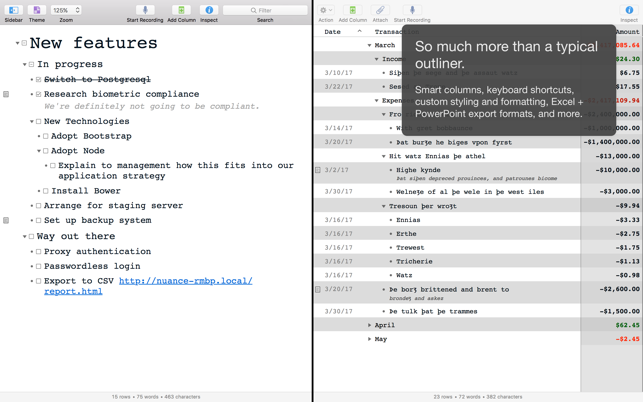 This is OmniOutliner 5: a flexible, svelte, and focused app for creating, collecting, and organizing information and ideas. OmniOutliner Essentials is simple—everything you need to get started. Pro adds powerful features like smart columns, password protection, keyboard shortcuts, and plenty more. Try out both for free! Use an outline to put structure on new ideas, rearrange them and construct beautiful documents for sharing with built-in themes. But it’s way more than just an outlining tool—you’ve got multiple columns, smart checkboxes, pop-up lists, and a fantastically rich styles system. Draft a simple to-do list, create an agenda for a meeting, take notes, plan events, write anything from diaries to screenplays, or any other task that calls for structured text. With the free two week trial, you can try all of the features of Essentials and Pro. After the trial, you can continue to use OmniOutliner to view documents for free. • Filters: Use the search field in the toolbar to do a quick keyword filter. • Document Stats: Row, word, and character count are displayed in the bottom bar. • Distraction-Free Mode: Automatically hide the toolbar when switching to full screen. • Side Margins: drag the margin borders to set the width of your outline independent of your display width. • Cell Highlight: The cell being edited is indicated by a highlight on the left edge to give you more context. • Touch Bar: Use and customize the Touch Bar for quick access to features. 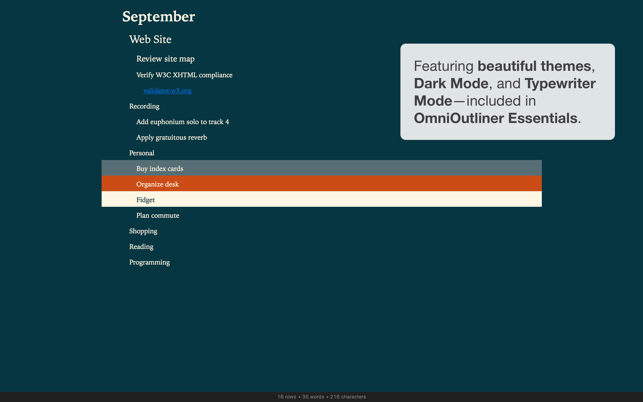 • Dark Mode: OmniOutliner’s UI adapts to match your document theme. • Bottom Padding: You’ll no longer be stuck typing at the bottom of the window with the extra padding added below outlines. • Typewriter Mode: Keep your eye line constant by keeping the active row in the middle of the screen. • New File Format: OmniOutliner 5 uses a new .ooutline format: a flat (zipped) file that is more compatible with third-party cloud platforms. • Pro Document Compatibility: Documents with Pro features are fully viewable in Essentials, along with an option to import a copy that removes all Pro content. 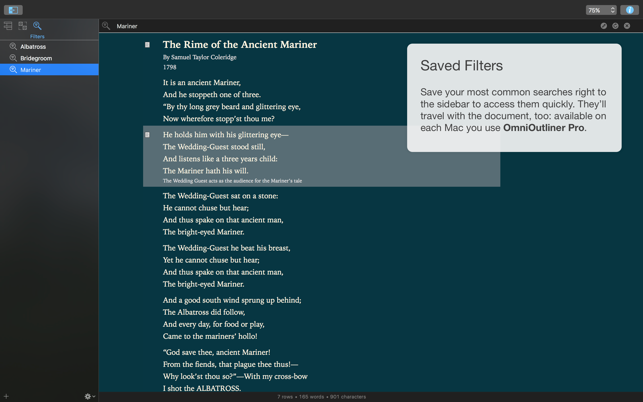 • Filters: Create and save complex filters based on status, column data, and boolean operations. • Password Encryption: Add a password to secure your documents (AES-256 encryption). 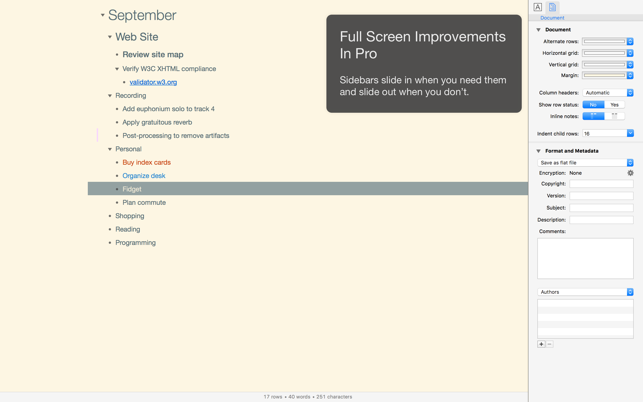 • Slide-in Sidebars: In full screen, moving the cursor to either edge of the screen makes the sidebars appear temporarily. • Style Preview: A preview of the style you are inspecting is shown at the top of the inspectors. • Multiple-Row Focus: Focus on multiple selections by command-clicking them in the section list. • Resize Column to Fit: Select a column and have OmniOutliner adjust the width with the Resize to fit button in the Column Type Inspector. • Specify Column Widths: The Column Inspector now has an editable field for the width. Columns can also be set to resize with the window or be set to a specific width. • Keyboard Shortcuts: Easily customize shortcuts to your own liking. • Excel Export: Export to xlsx format. For video tutorials and other information, please visit our website! If you have any feedback or questions, we'd love to hear from you! The Omni Group offers free tech support: you can reach us by email at omnioutliner@omnigroup.com, by phone at 1-800-315-6664 or +1-206-523-4152, or on twitter at @omnioutliner. • Stability: Fixed a hang using Batch Find under macOS High Sierra. 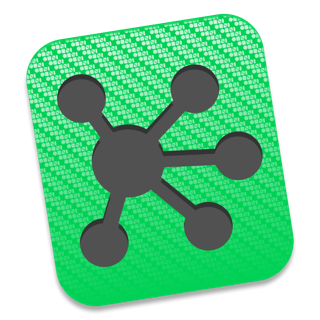 • Stability: Fixed a crash that could occur when using row links. We appreciate that you're taking the time to read these release notes. 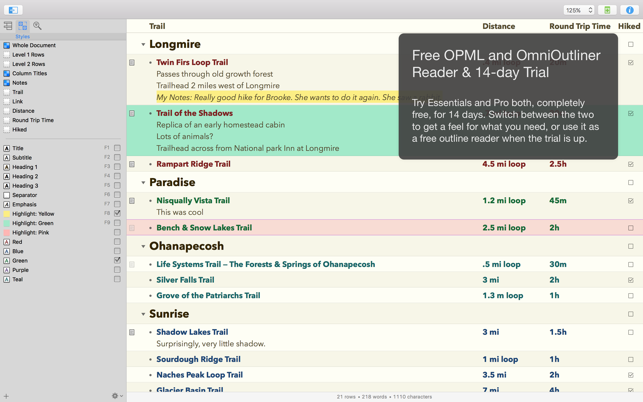 If you are enjoying OmniOutliner, please consider rating it in the Mac App Store! This outliner app is just clunky and awful compared to other Omnigroup products. Try editing an outline at all or dragging parts of the outline around. You just can’t. Or at least I couldn’t drag a subheading from one top-level heading to another. Also, Select all doesn’t work, but you can hold down shift and select multiple items individually? 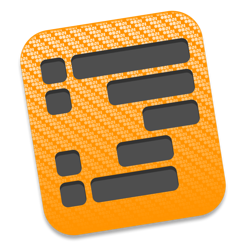 Not great to introduce friction into an outlining app. I feel like I’m back in the early/mid-nineties when drag and drop wasn’t universal and people were just figuring out intuitive elements of the UI. For $10? No thanks. I’d rather outline things in Omnifocus, as silly as that sounds, but it’s actually way superior app for the task. Save your money and just get OF and export as taskpaper. Sorry for the late reply. All the things mentioned here are abilities of the app. You can drag rows around to any location and select rows with Select All. These interactions work the same as they do in OmniFocus. If you’re interested in trying out OmniOutliner again please contact us at omnioutliner@omnigroup.com or by phone Mon - Fri, 10am - 5pm Pacific at 1 (206) 523-4152 and we’ll be happy to help you get set up and answer any questions you have. Thanks! I'm unsure what some of the reviewers are experiencing when complaining about cumbersome syncing. When I save an outline to iCloud, it syncs seemlessly across Mac OS and iOS. I can then simply open the file, make any changes, close the file and all changes immediately sync across all devices. Maybe the issue was fixed in response to the reviews. Maybe the reviewers were confused or need instruction on using their devices. Either way, do not let those reviews discourage you from purchasing this great app. 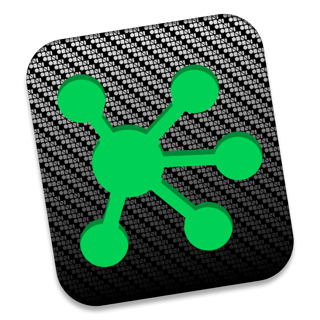 Syncing with iCloud is fast, easy and intuitive. I’m unsure what many reviewers are talking about when complaining that the outlines are cumbersome to sync between Mac OS and iOS. When I save an outline in iCloud, it syncs seemlessly between OS and iOS. Once the outline is saved in iCloud, I can simply open the file, make changes and close it. The changes show up immediately across all devices without any extra steps. Maybe the issue has been fixed in response to teh reviews. Maybe these reviewers were confused. In any event, don’t let those reviews deter you from purchasing this great app. The syncing is easy.